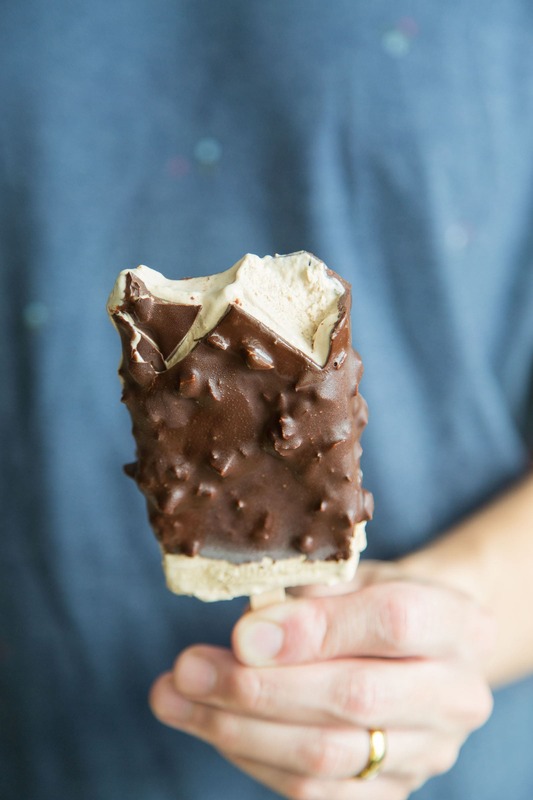 These almond mocha ice cream bars feature no churn mocha ice cream dipped in melted chocolate with chopped almonds. 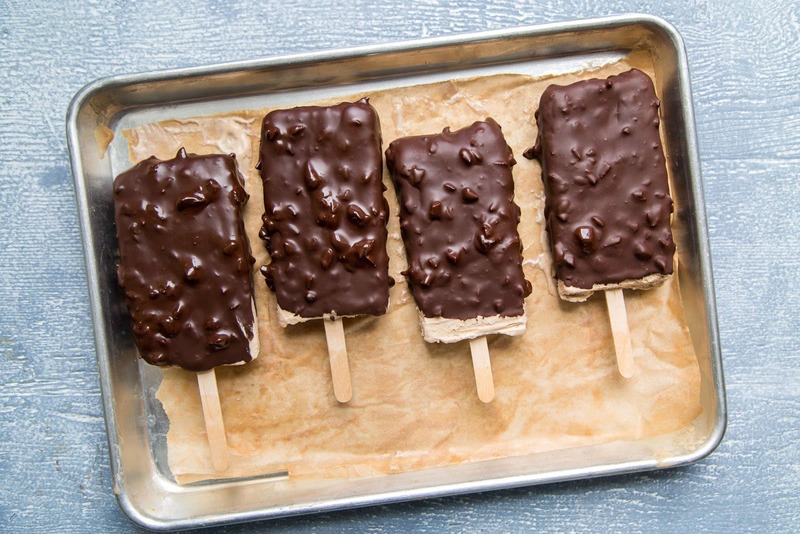 I have proof you don’t need fancy tools and equipment to make chocolate dipped ice cream bars at home. No matter how experienced or inexperienced you are in the kitchen, I have total faith in you. 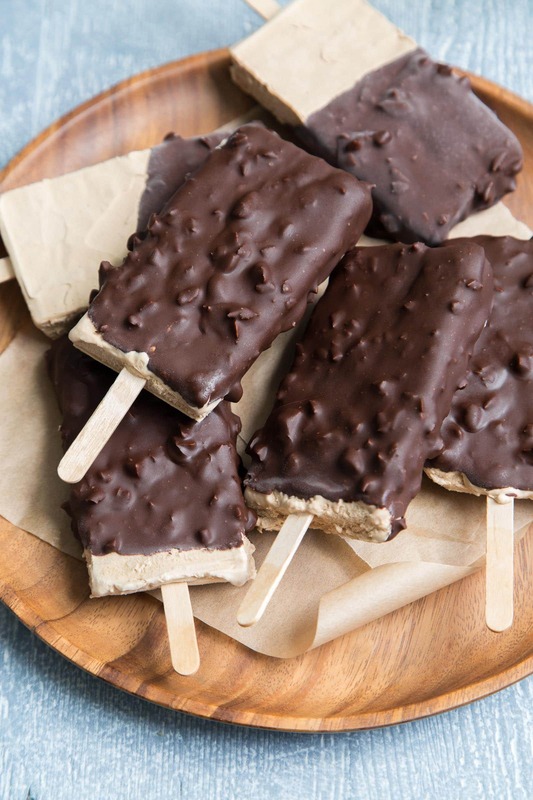 You, yes YOU, can make these almond mocha ice cream bars. 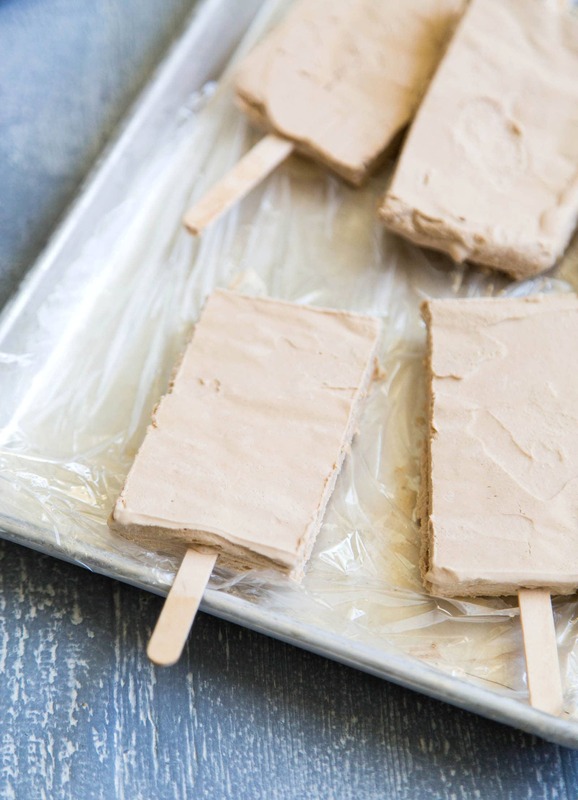 No fancy tools needed to make homemade ice cream bars! Here are the tools you will need: a hand mixer, standard quarter size baking sheet tray, plastic wrap, and popsicle sticks. This is assuming everyone has a freezer, stove top, a couple mixing bowls and a knife. Coffee and espresso run through my veins. I drink them up like water. I also consume a hefty amount of chocolate. Mix them together with a little milk, and you get one of my favorite flavors- MOCHA! These bars are made with no churn mocha ice cream and then dipped in a luxurious mixture of chopped almonds and melted dark chocolate. No churn ice cream is an amazing thing. Using chilled heavy cream and sweetened condensed milk, you can whip up all sorts of different no churn ice cream flavors. 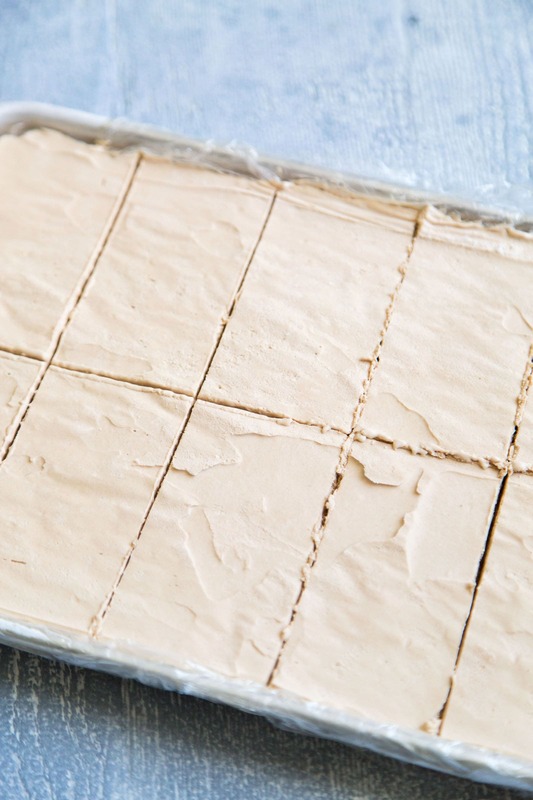 Evenly spread whipped mixture into a baking sheet lined with plastic wrap. Pop it in the freezer for at least 6 hours (overnight is best) until the ice cream is solid. Use a knife to divide the frozen ice cream into 10 equal rectangle bars. Work quickly! You don’t want the ice cream to get too soft. If the ice cream starts to soften, pop them back in the freezer until solid. The tricky part is adding in the wooden popsicle stick, but I have secret. 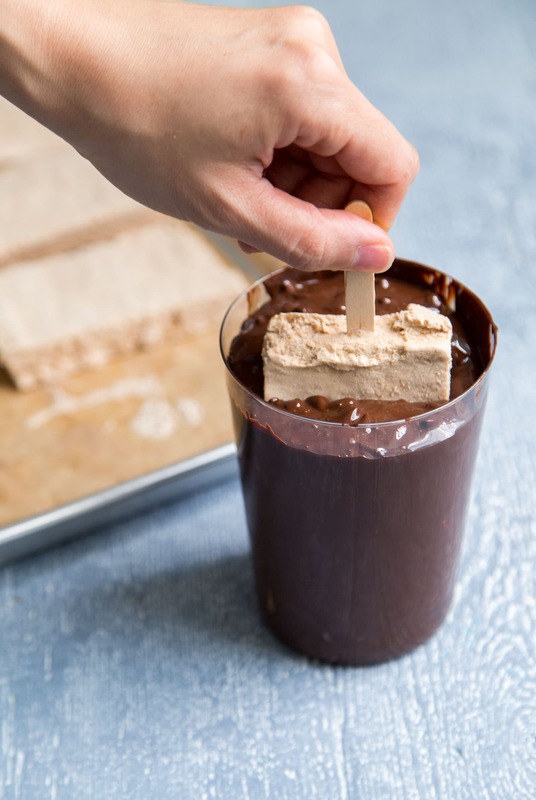 Soak one end of the wooden stick in water before inserting it in the cut mocha ice cream bars. The moisture from the wooden stick will help adhere to the ice cream better. Pop them back in the freezer until the sticks are firmly frozen to the ice cream. 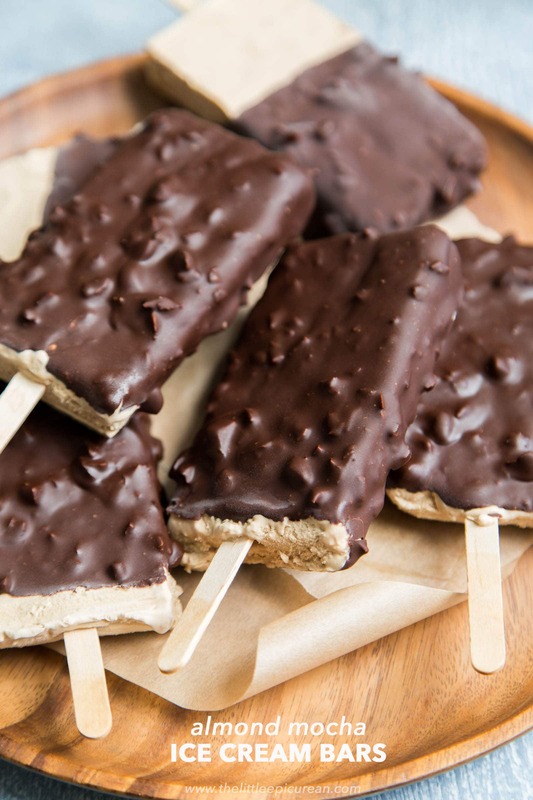 Coconut oil is the secret ingredient when it comes to coating frozen treats in chocolate. Coconut oil has a rather low melting point, turning into a liquid around 75 degrees Fahrenheit. On the other end of the spectrum, coconut oil begins to solidify around room temperature. I mixed in the chopped almonds in the melted chocolate. If you’d like, you can sprinkle on the almonds after coating the mocha ice cream bars in the chocolate. And there you have it, homemade ice cream bars! Whip chilled heavy cream to soft peaks. Add cocoa powder, espresso powder, vanilla, and condensed milk. Continue to whip to stiff peaks. Line a standard quarter baking sheet (13 x 9-inches) with plastic wrap, allowing plastic wrap to hang over all the edges. Line bottom of plastic wrapped baking sheet with parchment paper. Pour whipped mixture into prepared baking sheet. Spread into an even layer and place parchment paper on top. Cover with plastic wrap and freeze overnight, at least 6 hours until mixture is solid. Prepare almond chocolate shell. Combine chopped chocolate and coconut oil in a large bowl. Place bowl over a pot of barely simmer water, making sure that bowl does not touch water. Gently melt mixture and stir often to ensure even melting. Once mixture is smooth, remove from heat and wipe away any moisture from bottom of bowl. Fold in chopped almonds. Pour melted mixture into a tall drinking glass (wide enough to dip ice cream bars). Dip frozen ice cream bars into melted chocolate mixture. Chocolate will hardly upon contact with cold ice cream. Enjoy immediately, or individually wrap in plastic wrap and keep frozen until ready to eat. Chocolate dipped bars will keep in the freezer for up to two weeks. It may help to lightly soak wooden sticks in water before inserting in ice cream bar. This will help wooden stick adhere to ice cream. The chocolate dipping mixture will result with a thick chocolate shell. If you want the shell to be thinner, add additional tablespoons of coconut oil. To test thickness, dip a cold butter knife in chocolate mixture. Substitute chopped nuts of your choice in place of almonds. Wow these look delicious and so easy to make! These look SO good! I’ve never tried something like this at home but saved it to hopefully try soon! I’m in love with these. Anything coffee flavored is perfect for me. I want to make them now, but I just made my husband go on a cleanse (he’d been eating like crap), so now I have to wait. But I’m definitely saving this for later. Mmm I need to buy the popsicle molds from like Amazon and try some of these good recipes! Oh my! These ice cream bars look seriously amazing! The fact that they are made from ice cream that requires no churning, makes them even better. Can’t wait to try them, even though I know I will end up eating the whole batch! Yes! These look amazing. I love all things coffee so I’m pretty much drooling looking at the pictures. Love the thick chocolate almond shell too. Perfect for the hot weather we’ve been having. bringing back all my mocha almond fudge ice cream childhood memories (: and these tips are so helpful! esp the coconut oil for the magic shell; sometimes i try to get away with plain chocolate to dip ice cream into, and it’s usually a disaster lol. I love all things mocha. Definitely trying this!